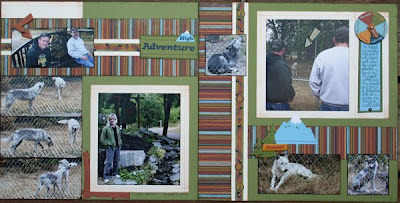 Our second day trip with Kyle was a quick visit to Wolf Haven. We arrived a few minutes prior to the tour, so it was perfect timing. 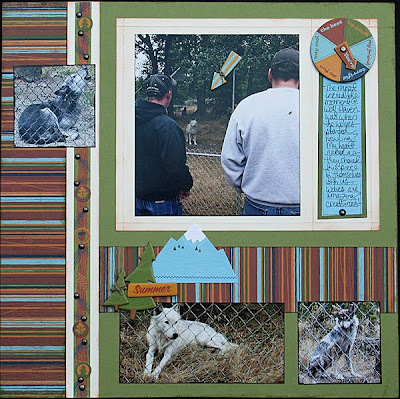 Wolf Haven is a sanctuary for many wolves but only 14 are on the guided tour. We didn’t get to see all of them, but the ones that were out were absolutely beautiful. They gave us a special treat about half way through the tour…wolves started howling on one end of the sanctuary and each of the wolves returned the call. It was breathtaking! According to the Wolf Haven website, “Vocal communication among wolves consists of howls, whines, growls and barks. Although all the functions of howling are not known, scientists think that one of the main reasons wolves howl is to assemble the pack. Another possible function of howling is to claim territory. Some experts think that wolves can identify other wolves through their howls.” I don’t know what they were trying to communicate, but I’m so glad that I witnessed it! 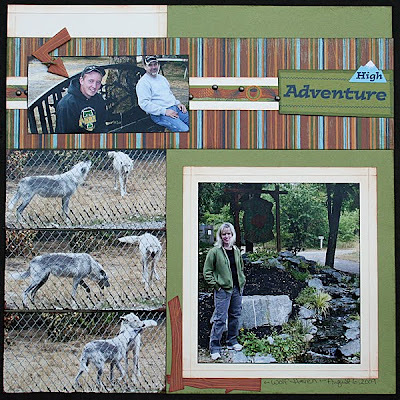 I’m aware that the title “High Adventure” makes no sense for this LO, but I was doing a direct scraplift from page 17 of the Summer 2009 Idea Book, and I couldn’t deviate from the design! LOL! All supplies are CTMH: Back Country kit, pewter brads, Adventure Dimensional Elements, natural hemp, sanding kit, and My Legacy Writers.